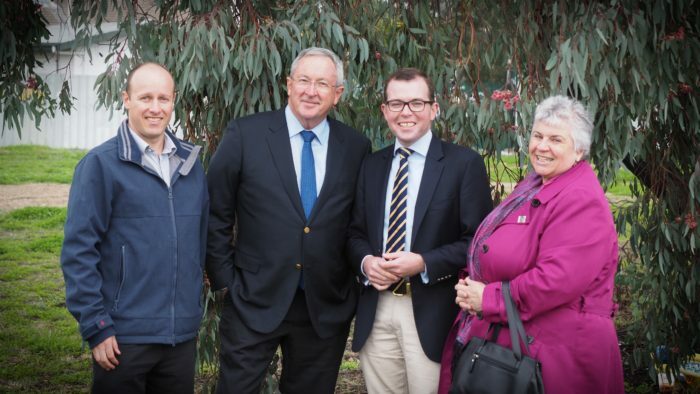 Moree Plains Shire Council Senior Strategic Development Officer Murray Amos, left, Minister for Family and Community Services and Social Housing Brad Hazzard, Northern Tablelands MP Adam Marshall and Mayor Katrina Humphries at Cooee Park yesterday. MOREE’S Cooee Park will soon be a welcoming meeting place for locals and visitors with the patch of parkland to get a $50,000 makeover thanks to the NSW Government. Member for Northern Tablelands Adam Marshall said Moree Plains Shire Council secured the grant from the Social Housing Community Improvement Fund (SHCIF). “The SHCIF is a wonderful grants program designed to build safer, more vibrant and inclusive social housing areas that can be shared by the entire community,” Mr Marshall said. “Council pitched a fantastic idea to construct a community meeting place in south Moree where people can come together, cook-up a few snags, toss the footy about and just relax. “This development forms part of council’s broader strategy to reinvigorate south Moree, which is something I’m very keen to support. In addition, Inverell Shire Council also secured $38,872 for upgrades to South Inverell Waratah Park for more seating and lighting to improve safety. Minister for Family and Community Services and Social Housing Brad Hazzard joined Mr Marshall in Moree yesterday to look over the site and meet and congratulate Moree Plains Shire Council. “More than $4 million in SHCIF grants were awarded in round one and the Northern Tablelands under the guidance of Adam Marshall was successful in securing a chunk of that money for two terrific projects,” said Mr Hazzard.